For a while, parents in search of a jogging stroller couldn’t even consider Graco’s lineup. 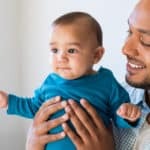 Like you, I have come to know and trust Graco over the years as an affordable budget to mid-range baby gear brand that always puts out quality products, so it was a little frustrating that active parents were left out of the equation. Now, though, Graco has upped the ante and made a stroller for those of us who want to take our little one along as we go for that morning jog. 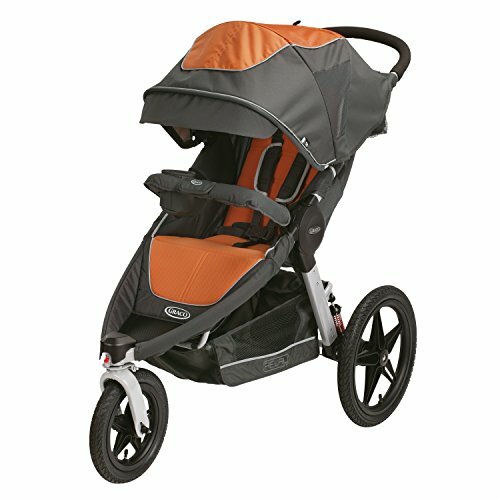 Introducing Graco’s premiere jogging stroller: the Relay! 5 Tell me about the seat. 6 What’s the fold like? 11 Where can I buy the Graco Relay? 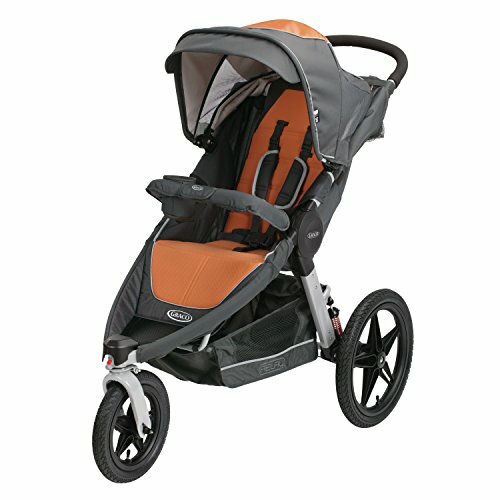 The Graco Relay is a performance jogging stroller with a high-grade aluminum frame, making it sturdy and lightweight. 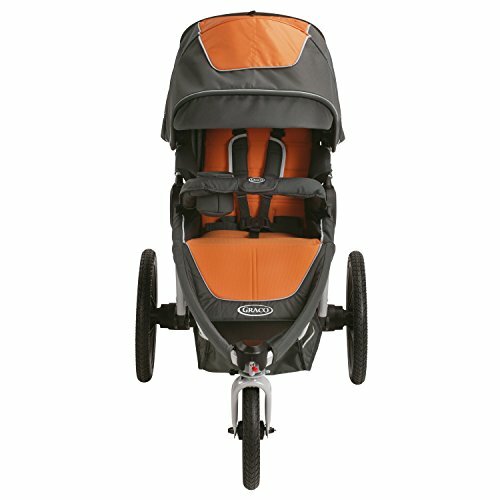 Often compared to the BOB Revolution for a lower price, the Relay carries your child up to 50 lbs and hold a total of 70 lbs (child plus essentials). The Relay accommodates the Graco SnugRide Click Connect 35 as a travel system and it has great stability and balance, so you don’t have to worry about it tipping over. The SnugRide car seat is rated highly by Consumer Reports. The car seat clicks right into the stroller, no adapters required. I love that! The wheelbase is over two feet wide, which is very good for stability, as mentioned when you use this stroller with the car seat. The tires are air-filled pneumatic (pressurized rubber), so you will have to fill up the tires now and then with a pump or use an air compressor at a gas station. It is a little bit challenging to get the air pump nozzle affixed to the valve on the front tire, but it can be done. Another point to consider is how big and bulky it is at 28 lbs. Like most all-terrain strollers or joggers, the Graco Relay takes up a lot of room. To compare, the BOB Revolution weighs 25 lbs, so you’re probably not going to notice the three-pound difference. In all honesty, the weight and bulk are the complaints written most often in my reviews for all terrain and jogging strollers. While the weight adds stability, hauling it in and out of the car is difficult. But the wheels do pop off pretty easily and some reviewers have remarked that once the stroller is in their car, space isn’t much of a problem. Because these tires are air-filled, the cushion from the air gives you a natural suspension system and you have a nice smooth ride. But the Relay takes it a step further and includes a premium suspension system. It virtually floats right over all those bumps and lessens the vibration. A simple flip of a lever at the front of the footrest cone locks the swivel wheel into place and provides better stability during your jog. Next to the locking lever is the tracking knob to keep your stroller rolling straight. Tighten counterclockwise if it veers right and loosens clockwise if it veers left. The rocker-style linked parking brake is simple to engage and release, and I prefer this style to the brake over each rear wheel. And one more safety feature: the tether. I like that it’s connected at the storage basket beneath the seat because most tethers are from the handle. If you were to lose contact with your stroller and fall, and you’re tethered from the handle, your stroller’s going to tip backward, possibly injuring your child. With a tether secured from lower down, the chances of an accident like that happening significantly decrease. I was impressed with the seat on this all-terrain jogging stroller. The seat back height is taller at 19¾ inches and 11¾-inch seat width allows for plenty of growth room. Graco Relay uses premium “tech fabric” which basically means it offers better breathability and airflow. Reflective piping throughout helps you be seen at night or low light conditions and the padding on the seat keeps your little one comfy when you’re going fast. An adjustable, padded 5-point safety harness switches over to a 3-point lap belt when your child is older for greater freedom of movement. While the buckle isn’t heavy-duty like luxury brands, it does the job securing your child safely. The seat uses a strap recline to raise and lower the seatback. To go back, push a button on the recliner and pull seat downwards. To incline, push the seat back up by pulling up on both straps. 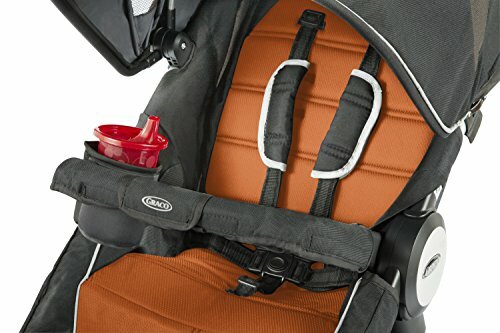 Your child gets a padded bumper bar with a cup holder and easily removes for ins and outs. The fold is unbelievably easy: just pull up on the little handle strap in the crease of the seat and your stroller folds itself! Moms love how easy and quick the Graco Relay is to fold. 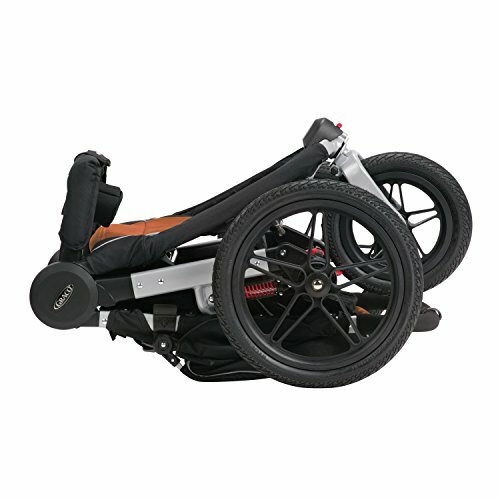 However, it does not have a way to self-stand, so it has to be laid down, and it does not have a frame lock to hold the stroller together once it is folded. Having these two additional features would have improved this product quite a bit because more than a few parents say the same thing. The sun canopy on the Graco Relay is certainly big enough to effectively shade your child. Fully extended, it goes out as far as the bumper bar but does not lower onto the bar. It has a flip-out visor to keep the sun off and a ventilated peek-a-boo window with Velcro tabs and a barrel button to keep the flap open. UV50 protection in the fabric blocks harmful sun rays during your outings. To streamline this stroller and give it less weight, there isn’t the usual plastic parent console tray at the handle. Instead, parents have a zippered pouch with mesh pockets that is strapped behind the seat. While you’re not going to be able to carry hot drinks, it holds water bottles just fine, and the mesh pocket holds even the largest smartphones today. There is an additional large mesh storage pocket behind the seat – and it is almost as long as the seat! I like storing an extra blanket, or something that folds up rather flat, in a storage area like this. The basket beneath the seat has also been streamlined down, as compared with the FastAction Fold Jogger, but it is still roomy enough to carry a small diaper bag. A pocket along the back end of the basket holds the safety tether when not in use. Lots of reviews have poured in for both the stroller and the travel system and Graco Relay has received high ratings for the smooth ride, easy fold and convenient Click Connect Travel System option. Many happy parents have remarked on how much they appreciate that they don’t have to buy any other accessories or adapters – all of what they need is included with the price. Lots of positive comments about the one-handed fold. A few customers have expressed a wish for the storage basket to be a bit bigger. Some mentioned that the front wheel valve is difficult with the air pump nozzle because it comes so close to the center of the wheel, but it can be done. There are a couple of parents who wish it had a better parent console that had a real drink holder, instead of the pocket flap between the handles. Where can I buy the Graco Relay? Ever since this product was released, I’ve been looking around at different retailers and I recommend you buy on Amazon for the best price and prompt, free shipping. Imagine yourself and your little one right now, running like the wind and feeling energized and alive with your new Relay!